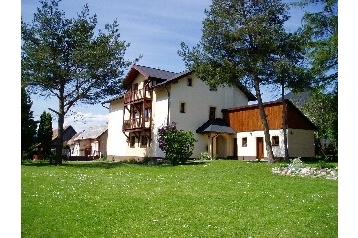 Accommodation in a family pension in the village Štrba. 6x bathroom with shower and toilet, dayroom with fireplace TV-SAT, DVD player, radio with CD player, sitting (28 persons), kitchen (gas cooker, gas oven, fridge with freezer, coffee maker, microwave oven, electric kettle, sandwich toaster, larder). Garden furniture, fireplace, kettle, garden grill, playground (swings, slide, sandpit), children playground, party games, for an extra charge: sauna, bike rental. Central gas heating. No smoking in the family pension. Parking in the yard 4 - 5 cars). Grocery shop 200m. Restaurant 400m. Bus 20m. Train (station Štrba - zástavka) 500m.